Of course, I’m not happy that he’s sick. Like any parent, I don’t like to see my kids suffering, even if that suffering is only mild. And in my case, since I work from home (and my wife works outside the home), when my kids are sick this means there’s another presence in the house pulling at my attention. Still, though I want them to be healthy and in school, I’ve also come to see the bright side of these occasional days of illness at home. 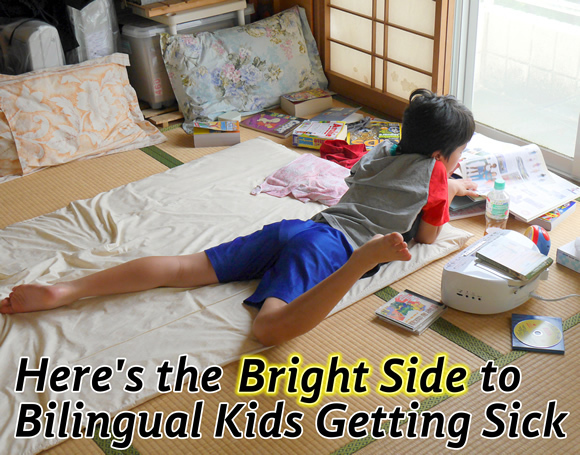 You see, when they go to school, they’re completely immersed in Japanese, our majority language, for most of the day. On weekdays, the time they’re exposed to English, our minority language, is generally quite limited by comparison, though I’ve long been as proactive as possible about maximizing that time through persistent routines and interaction. When they stay home, though, and they aren’t particularly ill, I can take advantage of that whole day to promote their exposure to English! On such days, we don’t let them watch a lot of TV or play much on the iPad (we wouldn’t want to make the experience of skipping school too appealing, right? ), which means they’re generally sprawled on a futon in the bedroom or on the couch in the living room with a lot of time on their little hands. Children, of course, find this predicament terribly dull, but from a crafty parent’s point of view, this state of confined boredom is ideal for captive reading and other forms of captive language exposure! I mean, either the child simply stares at the ceiling all day or engages in the sort of minority language input that we mindfully provide. 1. Place a large stack of tempting reading material by their side: comic books, picture books, nonfiction books, magazines, etc. And only offer reading material in your minority language! 2. Put a CD player by their side, too, with CDs of audio stories and music in your minority language. 3. If you have a regular homework routine, give them their reading and writing tasks. 4. Make a point of interacting with them, too, as time permits: talk to them, read aloud to them, play a game with them. 5. If you allow some TV or digital game time, this should be spent with TV shows or apps in the minority language. In other words, try to make the most of these sick days by actively promoting their exposure to the minority language with engaging resources and interactions. That said, our children’s good health is of course our highest priority. If they’re really feeling poorly, it would naturally be wiser to let them rest, as needed. Still, even at such times, reading aloud to them or playing CDs of stories or music could help nurture both better health and stronger language development. And while it’s true that I have my writing work to do, I reminded myself that this was a welcome opportunity to spend time with him and so I’ve tried to strike a suitable balance between work and play. As I stress in This Might Be the Very Best Thing About Raising Bilingual Kids, the bilingual aim and its demand for language exposure also encourages us to spend ample amounts of time with our lovable children, which, when all is said and done, is very likely the most joyful reward of all on this marvelous journey. How about you? When your children are ill, do you tend to both their health and their minority language? I previously worked as a bilingual nanny and would always do this. Reading Mister Men was a particular favourite for sick days. When my daughter is sick, her father and I, both working outside the home, will divide her sick days between us (we each have a limited number of sick kids days), and when it’s my turn, she only gets minority language input.